Application: Mel-Pro. 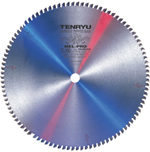 Use this blade for cutting melamine and laminated wood Materials and veneer-faced plywood. Hi-ATB design with negative (-5) rake angle tooth geometry - NO TEAR OUT! C-4 hardness, super fine grain, anti-corrosive carbide tips for the keenest edges and extended sharp life. Specially developed, top-grade, super fine grain carbide tip. Exhaustive, hand-hammer plate tensioning assures truer and smoother cuts.